Save the complexity for the wine, not the flight. While Idaho wines are receiving national acclaim, the winemakers are friendly, approachable and willing to share their stories. Schedule a tour, drop in for a tasting, and enjoy a weekend in Idaho Wine Country. The Idaho Wine Commission, Visit Idaho, and Alaska Airlines are proud to connect you with this growing wine destination. 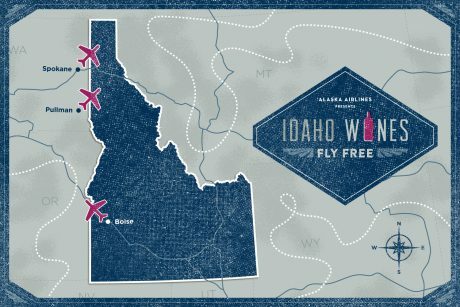 Wines fly free from Boise (BOI), Spokane (GEG), and Pullman (PUW). Now when you visit Idaho wineries, you and your new traveling companions can get home easier, and for less on Alaska Airlines. As a Mileage Plan™ member, you’ll be able to check your first case of Idaho wines at no additional cost. Not an Alaska Airlines mileage member? Sign up today, it’s fast, free and easy. How to Fly Your Wine for Free. Wine must be safely packaged for transport in a protective shipping container. TSA asks that containers not be sealed, but remain open for inspection. The first case free program applies from the Boise (BOI), Spokane (GEG), and Pullman (PUW) airports to all destinations served by Alaska Airlines in the United States. It does not apply to international destinations. Advise the Alaska Airlines Customer Service Agent when you check in so the box can be properly labeled with FRAGILE stickers. Items packaged in cardboard boxes are covered in case of loss, but are checked at your own risk for damage. View Alaska Airlines’ Checked Baggage Policies for more details.